Given the huge number of completely free VPN apps for iPhone out there, it is hard for any VPN company to say which the best. BUT here at Appsverse, we dare say it anyway, and here is why. At any given time, the Apple App Store is full of VPN apps claiming to offer best privacy features while still being completely free. "No-logs", "Wi-Fi Security" and "Privacy Protection" are some of the buzz words thrown at mobile users. Unfortunately, consumers are not given a host of statistics or real tools to put the company's word to the test or to prove it. While any completely free VPN app for iPhone you eventually download is likely to fulfill its intended purpose (such as to allow you to let you change your location, unblock certain geo-restricted content, or hide your internet activity from the government or internet service provider or ISP etc), what these VPN companies do with your private and sensitive data and also to your device still remains a subject of mystery. Completely free VPNs - Why should you worry about them? As VPNs companies incur very significant operating costs, the only sensible way that understand how completely free VPN companies can stay alive, is to know that they DO find a way to make money- and they are just not telling you how. In a study done by researchers at UC Berkeley, a technical investigation into over 283 VPN apps in the Google Play Store found serious privacy and security vulnerabilities such as possible malware presence, third-party library embedding, and traffic manipulation. Therefore, it is almost guaranteed that any completely free VPN app for iPhone iOS is likely to suffer the same fate. VPN companies have to run multiple VPN servers worldwide and which are kept alive 24/7 and often in quantities more than one given country or city. The high costs associated with keeping up the service is makes it impossible not to find ways to make money from its users or the users' data. 3. Analyzing your data for other businesses etc. Read here to read more ways how completely free VPNs make money from your usage data. Why is Appsverse & Proxy VPN different? At Appsverse, we have been seasoned players in the consumer and mobile privacy space for years now. Our top-ranking privacy browser, the Photon Flash Browser, not only allows users to run Adobe Flash on an iPhone or iPad, but can also helps users to hide their internet activity and or bypass geographical restrictions. It has always been our mission to make user privacy and security accessible to any Internet user in a completely safe and protected way. 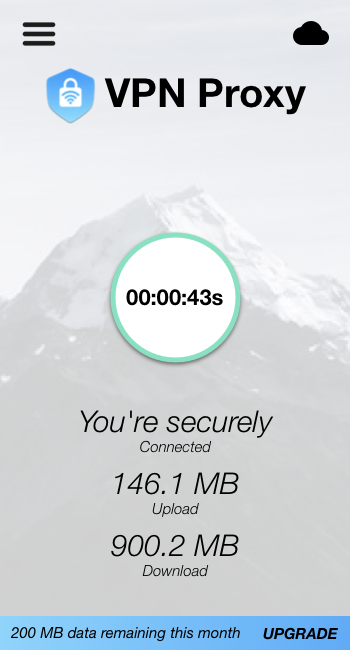 We knew that if we were to release a VPN app, it would be completely free but completely transparent and without any of the dubious practices used by the other VPN companies. Proxy VPN today is one of the top-rated and completely free VPN apps that you can download for iOS and Android. In less than a year, Proxy VPN for iOS is a 4.6-star rated app with over 4.4K ratings, while Proxy VPN for Android is 4.5-star rated app with over 179 positive ratings since 2 months ago in January 2019. It's a really bold statement to say that something is the best. If you are looking a something completely free VPN for iPhone, chances are your personal data and privacy is compromised. However, this is never the case with Proxy VPN and we would say Proxy VPN is the best free VPN app for iOS. Proxy VPN is the best, because provide nothing short of the best privacy and security features. In other words, we do our best to treat you better than how most paid premium VPN will treat you, but we refuse to charge you and choose to make it free and accessible for everyone. Download completely free VPN Proxy for iOS or VPN Proxy for Google Play and you will see what we mean. If you need free VPN for iPhone with no app, Proxy VPN is also available for Windows and MacOS (coming soon! ).